Given that it's Monday I'd normally have something clever or witty to post here. Maybe I'd offer a bit of obscure history, or just post a funny picture that made an obtuse gaming reference. However, I just spent the past several days as a booth assistant in Artist's Alley at Gen Con 2014. As such I'm too exhausted to offer anything insightful, funny, or even droll for your guys. Check this guy out instead. For those of you who don't know who this is, well you're in the same boat I was on the morning of the 14th. This fellow's name is Brent Chumley, an he's an accomplished artist as well as a surprisingly well-rounded gamer. 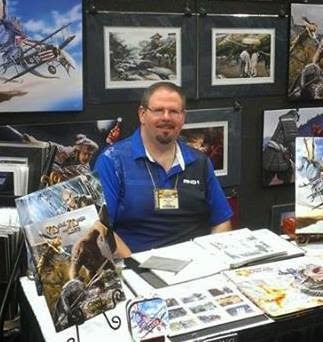 He was also my neighbor at Artist's Alley, and he's a very driven, talented artist. He's done a great deal of work for Legend of the Five Rings (as well as other companies and game systems), and his art is as diverse as his gaming tastes. From a traditional Asian spearman at rest after a battle to a biplane being chased through a clear blue sky by a dragon, he's got a little bit of everything. Seriously, go check out his webpage right here. You'll thank me later. I should be back on my game (so to speak) quite soon. Until then you know the drill; follow me by filling in your email address in the box on the right, or following me on Facebook and Tumblr. If you want to keep me going then buy a book, stop by my tee shirt shop, leave a tip by clicking the "Bribe The DM" button on the right, or stop by my Patreon page and become a patron today!